Town wall loop road (Stadtmauerrundweg) from Bacharach on the Rhine River along the medieval town wall to castle Stahlberg. 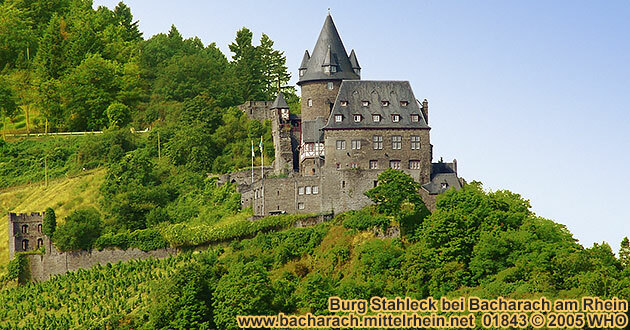 Extended on the Rhine hills out of town lies the castle Stahleck by Bacharach. It's exact date of origin is not known, but it has been proved that the castle was already occupied since the year 1095. It's first mentioned in documents in the year 1135 under Goswin von Hochstadt. In former times it was called castle Stabekkum or Sthaleckthum. 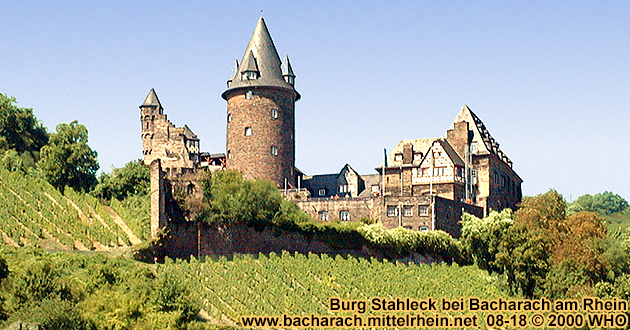 Until 1148 almost 10 years of fight followed for the rights of the Stahleck. Through evil manipulation Hermann, brother-in-law of King Konrad III, finally won. The palatinate and the estates fell to him. In the yeasr 1156, after the death of Hermann of Stahleck, his stepbrother Konrad von Hohenstaufen became count palatine of Bacharach on the Rhine river. 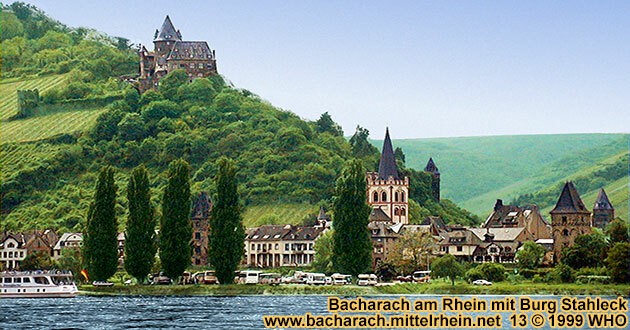 The town of Bacharach, which is situated on the castle mountain, became center and residence of the originating palatine territory on the Rhine river. 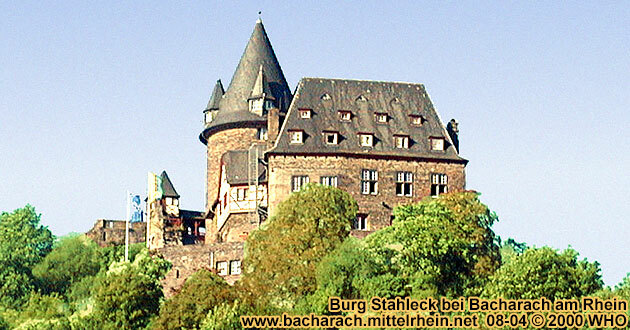 Castle Stahleck, which was originally the most farthest southern situated property of the Cologne bishops, was assigned from the emporer Barbarossa to his brother Konrad in the year 1190. In the year 1194, the wedding of Stahleck, the secret espousal between the son of Heinrich des Lowen and the daughter of the count palatine Konrad made history. 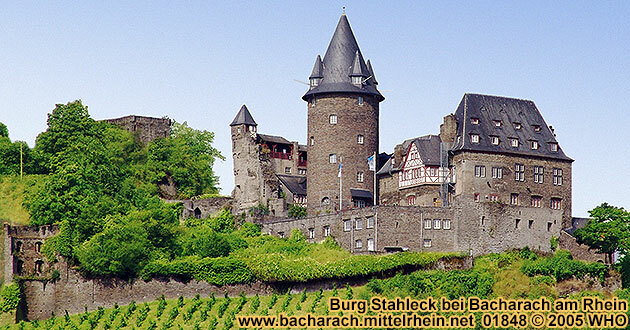 In the year 1214, the castle Stahleck near Bacharach on the Rhine river was appointed as a done feud to the Wittelbacher Ludwig of Bavaria, so that this mighty gender now had two ideal major locations near the Rhine river with the castles Stahleck and Pfalz. It became domicile of the palatine castle count and the official office staff. 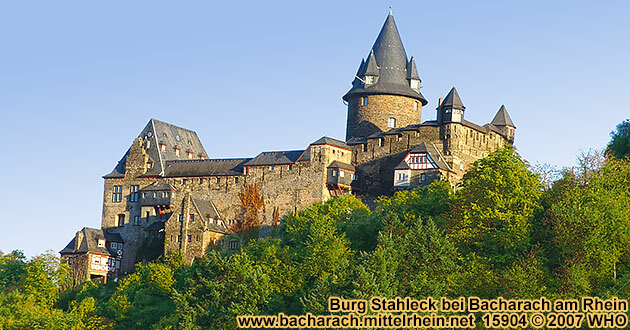 Castle Stahleck near Bacharach at the Rhine river was a rampart of the palatinate as control of the Rhine river. In the Thirty Years' War, in mid October of the year 1644, as the Catholic party banished the French out of the town with 250 cavalries and 450 Cologne foot soldiers, these fled into the castle Stahleck. 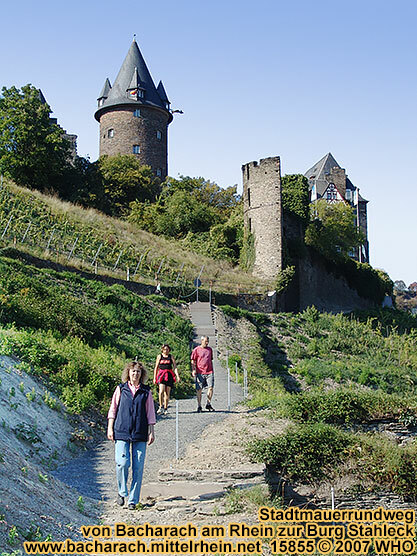 Colonel of Nievernheimb, commander on the fortress Ehrenbreitstein, let the castle Stahleck near Bacharach at the Rhine river thereupon be fired at without occupying it. 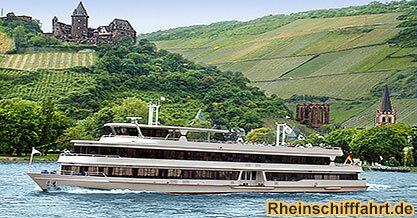 Bacharach on the Rhine River with castle Stahleck, Peterskirche (Peter's church) and the towers Marktturm and Munzturm. 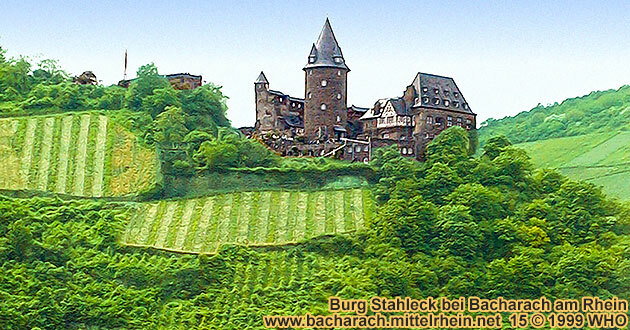 Castle Stahleck high above Bacharach on the Rhine River. 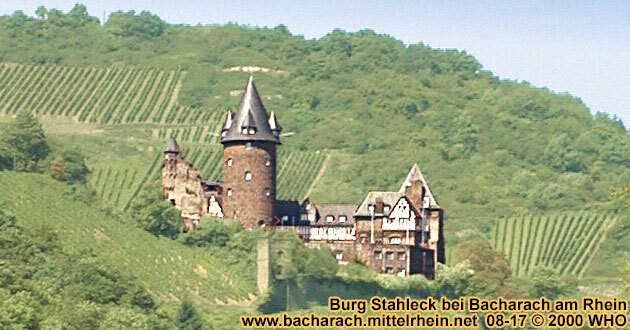 Castle Stahleck high above Bacharach from the right Rhine River side.